Each team wishes it had the best quarterbacks in the NFL, but not everyone has that football talent that others clearly do. With the preseason half way over with, with must come to terms with which teams have realistic odds of actually getting to the playoffs and ultimately to the Super Bowl. We have already previously graded the quarterbacks in the League, but a few things have changed since then. Fans should be looking for quarterbacks that are able extremely reliable on the field, especially with signal-calling. Some may disagree, but their performance does not lie, as well as their potential to actually take their team far this season. This is why we have excluded QB’s like Robert Griffin III or Eli Manning, as they do not look like they would be able to perform up the hype that they have been given. Manning is trying to become the highest paid quarterback in the league, and he may actually get that deal, but his overall performance is not of a top ranking player. 5 Tony Romo Cowboys Finally got team back into playoffs in 2014 and is looking good so far. 4 Russell Wilson Seahawks A dual threat that has taken the team to two Super Bowls. 3 Andrew Luck Colts Has talent and his performance has been improving exponentially. 2 Tom Brady Patriots Led team to Super Bowl victory, with great performance improvement over 2013 season. 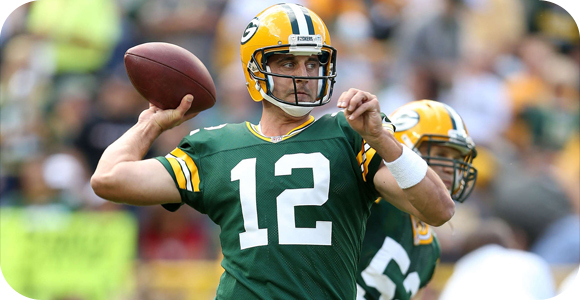 1 Aaron Rodgers Packers Constantly accurate passes, keeping his performance at a steady high for years. There are many reasons as to why other great QB’s did not make this list, like Peyton Manning. Manning is a shoe-in for the Hall of Fame with his amazing talent and performance over many years, but this does not include the present, as his performance has been lacking; it could just be the old age. Despite Brady having the possibility of missing out on the first four games of the regular season, he has never been one to shy away from a challenge; just look at how his improvement from 2013 to 2014 led the team to a Super Bowl victory.